A Table in the Kitchen? I recently had the most unique dining experience I’ve ever had in a restaurant–I was seated in the kitchen! A wonderful upscale Italian restaurant near us has adopted the bold move of offering a “Chef’s Table” which essentially is a table set inside the kitchen with a view of all the goings-on. The table must be reserved well in advance, as it is a popular special occasion dining adventure. After a tour of the wine cellar, we were treated not only to a great view of all the stations in the kitchen and an explanation from the head and sous chefs on what they were preparing, but also to a very ambitious tasting menu with matching wines: Grilled asparagus salad with arugula and strawberry, Tuna ribbons with avocado, Bloody Mary scallops with smoked bacon and tomato vodka sauce, Crispy pork belly with quail eggs and fennel hash, and New York strip with potato gratin. When I commented on more than one occasion over a particular pasta and seafood dish, the chef plated up a scaled down portion for all of us to try on top of our already five-course meal. 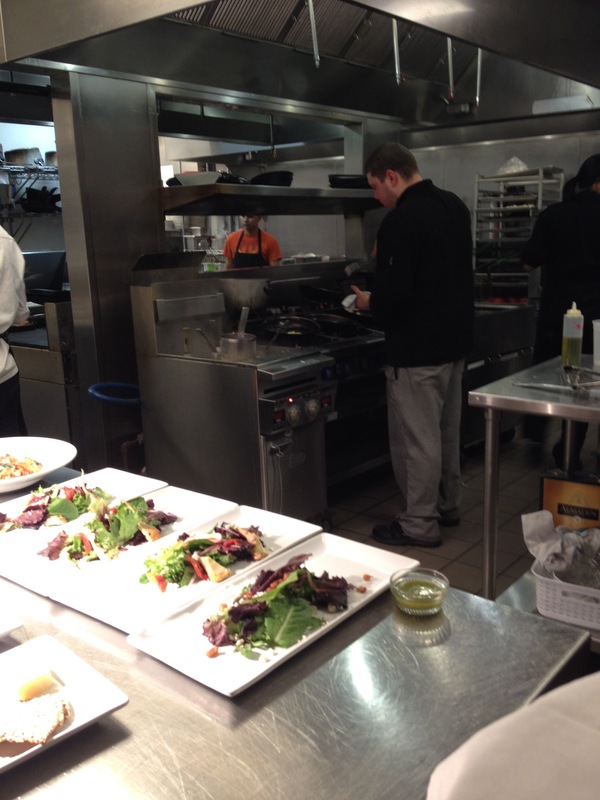 It was an education both in taste and in how a very busy commercial kitchen works…and a lot of fun!